Today you begin your journey by boarding your international outbound flight to Siem Reap. Arriving in Siem Reap today, you're met and taken to your hotel. After some time to relax, head out for an afternoon tour of the beautiful temples of Banteay Srei and Banteay Samre. Banteay Srei means ‘Citadel of the Women’, and your private guide can explain how it's locally considered to built by women as the carving is too fine to be done by the hand of a man. Early this morning visit Cambodia's most iconic site, Angkor Wat. Explore this incredible temple in the early morning light, escaping the crowds. Your private guide will be able to help you explore the site, finding hidden spots that don't make the postcard images. This afternoon experience something different and escape from the temples and town of Siem Reap with a private boat trip on Southeast Asia's largest freshwater lake, the Tonle Sap. With your experienced guide, visit some of the floating markets and experience the remarkable daily life of the people so entwined with this unique biosphere. Keep your eye out for some rare birdlife too. 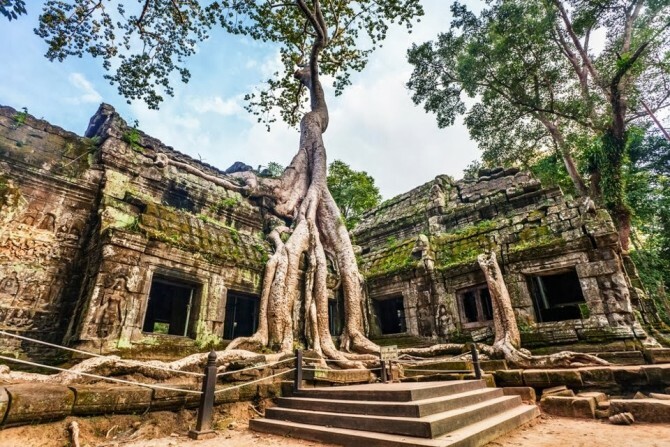 Begin your exploration of the magnificent temples of Angkor today, visiting the enigmatic Ta Prohm at dawn with an experienced private guide. You may choose to head back to your hotel for some relaxation time or continue exploring should you wish. After lunch, continue with a private guided tour of the ancient city of Angkor Thom, which houses the charismatic faces of the Bayon. Finish the day watching the sunset from the Bayon. A final day to continue exploring the temples of Angkor - accompanied by your guide, the itinerary can be tailored to your interests. Perhaps discover new temples or revisit some of your favorites from the previous two days. A free day in which to explore Siem Reap town, enjoy a leisurely day by the pool, join a cooking class or indulge in a spa treatment. Your guide takes you to the airport for your flight to Phnom Penh this morning. Arriving in the capital city, check in to your hotel before embarking on a tour of the city's cultural highlights on a private guided tour. The Royal Palace and National Museum are particularly delighted as well as the busy market and a number of vibrant pagodas. Today is a sobering experience exploring the recent turbulent history of a nation virtually destroyed by civil war. Your private guide can take you to the Killing Fields outside Phnom Penh and also to the genocide museum, a stark reminder of the atrocities of the Khmer Rouge. This afternoon is free for you to explore the city by yourselves, you could have a wander around the Russian market. Drive to the coastal village of Kep today with your private driver and guide. This three-hour journey passes pepper plantations which were once one of the most in-demand spices in the world. The quiet fishing village of Kep is the ideal place to relax at the end of your holiday. A day at leisure. You may wish to visit the Rabbit Island, a short boat ride away from the mainland. Spend the day relaxing in a hammock, swimming in the sea and feasting on seafood. Today is free to relax. Your hotel has a wonderful pool area or you might like to try out the spa. For a special occasion, you might like to book a private barbecue overlooking the Kep National Park.